Latest podcast episode features live, unfiltered interviews with driven inventors seeking marketing partners, buyers, licensing and manufacturing deals. CEO Powercast Episode 10, available now via iTunes and http://www.ceopowercast.podbean.com, takes listeners behind closed doors and onto the show floor of the largest invention trade show for inventors, investors and entrepreneurs in America. INPEX 2016 was held June 7-9 in Pittsburgh, Pennsylvania at the Monroeville Convention Center. Podcast co-hosts Evan Morgenstein and Charlie Fusco were among the many CEO’s and corporate executives in attendance vetting new products and services from today’s top inventors. The duo was lucky enough to catch up with several attendees and the inventors behind Tabolap, Stiff Collar Stay, VaNicci and Yatra to talk about taking risks, inventory management and the importance of planning ahead to impress potential investors. Tabolap has created a portable laptop workstation, capable of transforming from a laptop carrying case to a comfortable laptop table. During the interview with Tabolap, Charlie shared some great insight into managing inventory and taking uncomfortable risks. Stiff Collar Stay is an adjustable collar liner that gives the appearance of a stiff, pressed shirt collar. Their impressive 2-minute demo video proved to be a crucial selling point for potential marketing partners and investors. Morgenstein and Fusco also spoke with the inventor behind VaNicci, a hair and root dye product currently in the development stages. The discussion covered the importance of on-site demo samples for networking events like trade shows and how proper planning can strengthen the impact of any pitch. Morgenstein deemed Yatra, a portable waterproof speaker line, the “product of the show”. He even bought one for his son! The CEO Powercast co-hosts praised the inventors for not only a superior product, but also for their attention to detail in packaging. Packaging serves as the first impression for consumers and must encapsulate the true aura of the brand. 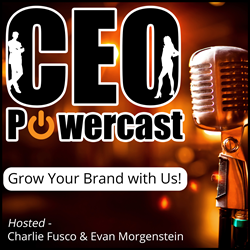 Listen to Episode 10 of CEO Powercast available now and subscribe to the podcast on iTunes to automatically receive new episodes to your phone, tablet or PC.